My most recent trip to the Dollar Store was focused on items that I could use to help my toddler with his fine motor skills. I was pleasantly surprised by all of the items I found right away that I knew he would not only enjoy but would also serve the purpose I was looking for. We will be using the relish tray and pom-poms to work on sorting by color as well as an opportunity to work on my son’s pincher grasp. The salad tongs will then be introduced as a way to pick up each pom-pom individually for sorting, encouraging his fine motor skills. So far my son’s favorite thing is to screw and unscrew the lid to the Tupperware! I wanted to have a couple fun things for him to take in and out of it so I purchased the shower loofa and mini dinosaurs. He loves to squeeze the shower loofa and count the dinosaurs as they go in and out of the Tupperware. Sorting the marbles in the ice cube tray has been very intriguing for him. He likes to drop the marbles from a foot or two above the tray and see them bounce into a spot in the tray. Remember that marbles should only be used with full supervision as they can be a choking hazard. We use the measuring cups to dump the marbles or pom-poms into each other. At first when he would try this on his own he would miss and get frustrated. He’s learned to line the second measuring cup up and pour slowly and now he is so proud of himself! 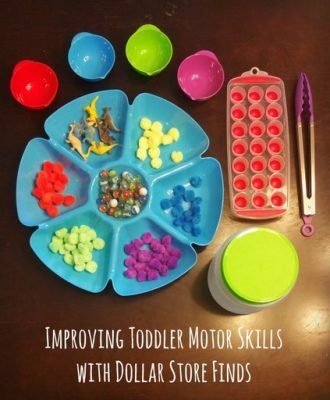 For less than $10.00 I feel like I’ve been able to significantly help my son with his motor skills as well as give him some fun, alternative activities on these hot summer days! Have you discovered some other ideas like these? I’d love to hear about them!